I hooked up with Kyle when he got home from Viet Nam in 1971 or '72. He'd been in an Army hospital recovering from being paralyzed in combat. He was in a wheelchair. I tried not to cry when I saw him. This was especially hard for me to calm down about because Kyle and I had run on the Midvale Junior High track team and later at Hillcrest. He was so tall and so fast that it didn't make sense how a guy that tall and skinny could run like that! Kyle died in the early 90's from complications of his wounds after all those years. I left his mother a note at his funeral to be sure and petition the Army to have his name added to the Viet Nam Memorial in Washington. She wrote me a nice thank you note and said she had done as I suggested and the Dept of Defense was going to add him. 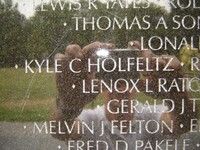 The last time I was there, about 2 years ago, I snapped a pic of his name on the memorial. You can copy and past the link below to see it. Thanks, Scott, for that story. I think Kyle was just everyone's friend. He had that kind of personality and the world came up short one good-natured, soft-hearted soul when he passed. Kyle and I grew up in the same general neighborhood in the East Midvale 1st ward before it was split (5th ward). I still carry in my day-planner the pencil "rubbing" I made of his name on the Vietnam Wall in Washington D.C. (5W line 88). I am proud to be able to call him a friend and especially a partiot and defender of our American freedom.